Lake City, Colo, feels like a good place to escape the rest of the world. To the south, State Highway 149 winds through the San Juan Mountains over 11,500-foot Slumgullion Pass. You’re more likely to encounter a herd of bighorn sheep licking salt off the road here than an actual traffic jam. To the north, the road meanders in a narrow, often icy canyon alongside the Lake Fork of the Gunnison River. The next town is 60 miles away. The town’s isolation conveys a sense of immunity to the problems facing much of the urbanized West. Downstream from the second largest natural lake in Colorado, there’s definitely enough water for the town’s 400 residents. And there are hardly any immigration issues, unless you count the Texans who flock here in the summers. A woman gets a flu shot. Courtesy Flickr user Lance McCord. So it’s not surprising that some Lake City residents assume their isolation protects them from diseases like measles, mumps and whooping cough. Nearly 30 percent of the children in the town’s single pre K-12 school aren’t fully vaccinated – almost seven times higher than the statewide rate of 4.3 percent. Parents are required to vaccinate their kids in order to enroll them in public school or a licensed daycare. But Colorado allows three types of exemptions: medical, religious and personal belief. In Lake City, as elsewhere in the state, the vast majority of non-vaccinated children have personal belief exemptions. A bill in the statehouse in Denver is trying to bring that number down by making it harder to fill out a personal belief exemption form – which currently only requires parents to check a box. The growing popularity of the personal belief exemption, and the rising rates of un- or undervaccinated kids, is a concern to public health officials. Children who don’t get all of their shots, or don’t get them on the schedule recommended by the Centers for Disease Control and Prevention (CDC), are more likely to come down with vaccine preventable diseases like whooping cough than kids who are fully vaccinated on time. And to make matters worse, a 2008 study by Dr. Saad Omer, a professor of global health at Emory University who has studied vaccine exemptions extensively, found that clusters of vaccine refusal are associated with risk of whooping cough outbreaks in entire communities, not just among the unvaccinated. Many of the most well-known clusters of vaccine exemptions are in the West. Ashland, Ore., was dubbed one of the least-vaccinated cities in the U.S. by Frontline, which filmed part of its 2010 documentary “The Vaccine War” there, after the CDC held public meetings in town to figure out why the opt-out rate was so high. On Vashon Island in Washington state, nearly 25 percent of kindergartners have skipped at least one vaccine, similar to Ashland’s rate. In individual schools, the rate can be even higher: at the Yuba River Charter School in Nevada City, Calif., for example, 81 percent of students have personal belief exemptions. Although these communities seem to have a lot of traits in common – progressive politics, strong environmental ethic and a back-to-the-land or homesteading lifestyle – there’s not a lot of good data on what kinds of people tend to forgo vaccination. A 2009 study showed that parents who opt out were more likely to live in well-educated, higher-income areas than non-refusers. Omer’s 2008 study of vaccine exemption clusters in Michigan found they were associated with high population density, more racial and ethnic minorities, larger families and more kids under 5 (although he says all associations except family size were “of low magnitude”). Parents give a number of reasons for opting out of vaccination: the long-discredited theory that vaccines cause autism, concerns about unnecessary toxins in the vaccine formulas, a belief that natural, acquired immunity is superior to immunity from a vaccine, or the assumption that they are unlikely to get any vaccine-preventable diseases anyway. It’s important to note that there is absolutely no debate in the medical, scientific community about the efficacy of vaccines. There are instances of people being injured by vaccines, but the harm they cause is far outweighed by the good they do for public health worldwide. Now, four of the Western states with some of the highest rates of personal belief exemptions are trying to make it harder to opt out. In 2011, Washington state was the first to pass a law requiring parents to get a doctor’s signature before opting out for personal belief reasons. Since then, the state has seen its exemption rate among kindergartners drop from a high of 7.6 percent in the 2008-2009 school year to 4.6 percent in 2012-2013. Vaccine exemption rates in Washington state dropped after a 2011 law that made parents see a doctor before getting a personal belief exemption. Courtesy Washington State Dept. of Health. Similar laws in Oregon and California went into effect this year. Now, Colorado’s legislature is trying to pass its own law requiring parents to either see a doctor or watch an online class on the benefits and risks of vaccines before opting out. The bill’s sponsors say the idea is that by making it harder to opt out, it will eliminate the group of parents who think it’s more convenient to sign a personal belief than take their kid to the doctor. Dr. Irene Aguilar, a state senator from Denver who is co-sponsoring Colorado’s bill, says another goal is to make sure that people who choose not to vaccinate are making that decision based on scientific, evidence-based information. Opponents say the laws assume parents seeking a vaccine exemption are uneducated, and requiring them to see a doctor or take an online class not only undermines parental rights, but is coercive. The outskirts of Lake City, Colorado. Courtesy Flickr user Alex Berger. But there is a difference between a pap smear and a vaccine – cervical cancer isn’t contagious. Diseases like whooping cough are. When we talk about vaccines, we’re not just talking about personal choice, says Dr. Aguilar, we’re talking about the ability of other parents to keep their children, and themselves, safe, too. No one is completely immune from diseases, and vaccines can and do fail. But if enough people get them, the likelihood that a disease like measles will make a comeback is pretty low. 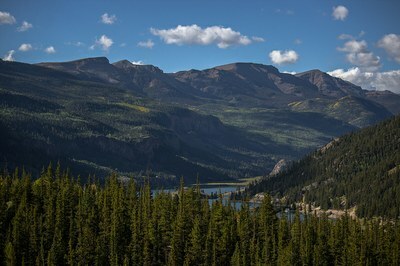 Yet as the vaccination rate drops, everyone is at a higher risk of getting sick – even people who feel protected by living a remote valley at the edge of the San Juan Mountains.